quello da “butto”, e le sue segrete — e che colleghi i materiali alla storia dell’edificio che li ha così a lungo conservati. Nella torre sud-ovest è esposto un vero e proprio “servizio da tavola” composto di diciotto piatti in ceramica graffita, probabilmente commissionato per un particolare avvenimento da chi abitava la fortezza all’inizio del XV secolo. Nel mastio, tra i boccali esposti e ritrovati nel pozzo d’acqua, spicca quello in maiolica arcaica decorato con l’aquila, stemma degli Alidosi. The ceramic pieces, found inside the Rocca during restoration work from the 1960s onwards, amount to a valuable legacy that provides tangible evidence of life inside the fortress. 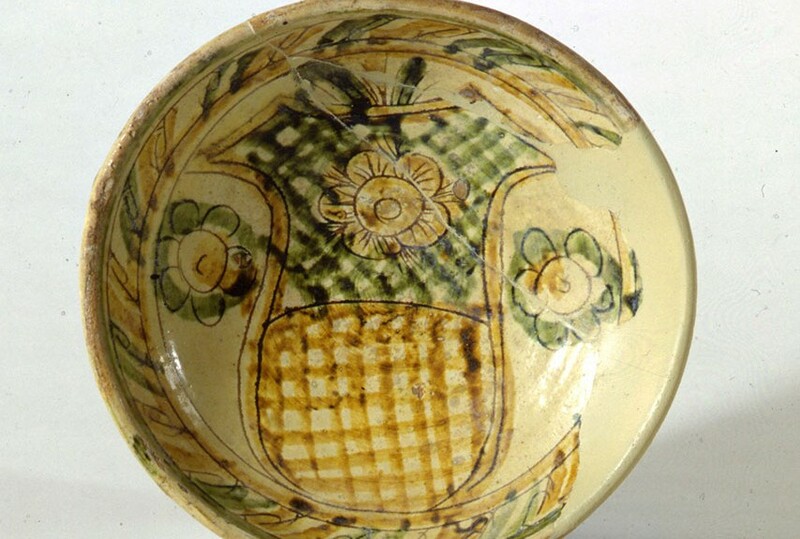 The earthenware bares heraldic decorations and marks which denote various uses; traces that indicate the habits, preferences and social conditions of those who lived in the Rocca from the 14th century through to the 19th century. The best way to view the collection is along a route that highlights the different places in which the pieces were found, especially the keep with its two wells, one for drawing water and the other for tipping garbage, and its secret rooms. This itinerary also connects the materials to the history of the building that has preserved them for so long. In the South-west tower it is displayed a “dinner service” of eighteen plates made of “archaic graffito” ceramic probably commissioned for a particular event in the life of the 15th century inhabitants of the fortress. In the keep the jug decorated with the eagle, Alidosi coat of arms, stands out among the archaic majolica jugs found in its internal well.